"Best Value" - The 4ft Monet Bench! 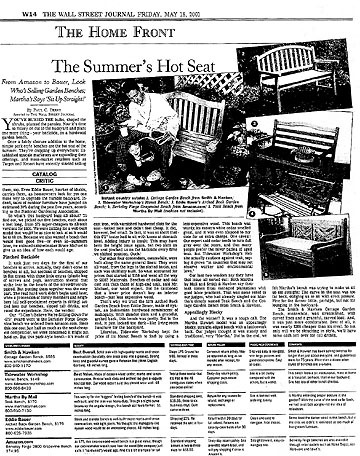 Wall Street Journal Catalog Critic (Friday, May 5, 2001 issue) named Tidewater Workshop the "Best Value" for our 4ft Monet Bench, compared to other companies such as Martha Stewart Living, Amazon.com and Smith & Hawken. The Catalog Critic is a weekly feature in the Wall St Journal Weekend Journal. The writer places orders from catalog and internet companies anonymously, and then independently reviews the product, company and overall experience. From Amazon to Bauer, Look Who's Selling Garden Benches.